While there’s a chance you may not have heard of Puravida, their style and designs should seem familiar. The colorful, handmade string bracelets are the original creation of two Costa Rican artisans and are worn by millions around the world! About 12 years ago, friends Griffin Thall and Paul Goodman happened to cross paths with the two bracelet artisans, Jorge & Joaquin, while traveling through Costa Rica. The friends became intrigued and asked them to create 400 bracelets to bring back to the States with them. Griffin and Paul commissioned the bracelets at a local boutique, and they sold out in mere days, with requests for more. Soon a partnership between the four men was born. Today, Puravida bracelets, anklets, rings and accessories are skillfully handcrafted by talented artisans around the world, in endless color combinations and hip, indie styles. Click on any image to learn more! “Pura Vida” means “pure life” in Spanish, a Costa Rican philosophy that encourages the appreciation of life’s simple pleasures. “Pura Vida” means living life to the fullest while at the same time slowing down and enjoying the moment. Puravida's simple, string bracelets tend to symbolize the simpler things in life, with each bracelet is as unique as the person wearing it. Giving back has always been at the heart of Puravida. They provide full-times jobs in positive working conditions to over 150 artisans worldwide. They also started the Charity Collection, teaming with over 190 different charities around the globe. To date, Purevida has donated more than $1.4 MILLION DOLLARS! 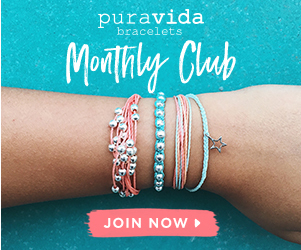 For $14.95/month you can join the Puravida Monthly Club and each month receive 3 exclusive bracelets (up to $50 value) that are only available to Puravida Club members! Their team of Instagram influencers and stylists will choose your styles, and shipping is completely free on all US orders. ​Have you purchased from Puravida before? Do you love it? Let me know in the comments below! ​The Ultimate Cancer Medicare Guide: What You Need To Know. An in-depth guide about navigating the financial shoals of treating cancer. Patients should not only learn about the medical aspects of cancer, but also understand how to protect themselves financially. This post contains affiliate links and I will be compensated if you make a purchase after clicking on my links. At Home With Daneen is donating ALL affiliate income earned from this post to the Breast Cancer Research Foundation. I urge you to please consider donating to the cause, no matter how small. Together we can all make a difference!